Debut novelist Mark Alpert brings one of the most explosive books of 2008, seamlessly weaving current issues of science, history, and politics with white-knuckle chases. David Swift, a professor at Columbia University, is called to the hospital to comfort his mentor, a physicist who's been brutally tortured. Before dying, the old man wheezes "Einheitliche Feldtheorie." The Theory of Everything. The Destroyer of Worlds. Could this be Einstein's proposed Unified Theory--a set of equations that combines the physics of galaxies with the laws of atoms? Einstein never succeeded in discovering it. Or did he? Within hours of hearing his mentor's last words, David is running for his life. The FBI and a ruthless mercenary are vying to get their hands on the long-hidden theory. 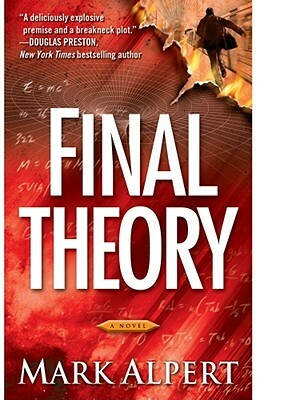 Teaming up with his old girlfriend, a brilliant Princeton scientist, David frantically works out Einstein's final theory to reveal the staggering scope of its consequences. With publishers around the world snapping up rights in twenty-two countries, the book has already become a global phenomenon, and the dynamic characters and gripping plot will keep readers compulsively turning the pages until the very end. Mark Alpert is a contributing editor at Scientific American and an internationally bestselling author of science thrillers. His novels for adults—Final Theory, The Omega Theory, Extinction, and The Furies—are action-packed page-turners that show the frightening potential of near-future technologies.